Chris and Oliver Wood were both into roots music growing up in Colorado. For 15 years they pursued successful careers apart. In the mid 2000’s they started working together with the siblings recording a number of records in Music City. The Wood Brothers are now considered a Nashville based band. Thus their three night engagement at 3rd and Lindsley were homecoming concerts. The 1st of 3 was a sold out show on December 4, 2015. Each night featured different guests. On Saturday Seth Walker and Amy Helm were scheduled to perform. Sunday (12/06/2015) showcased The McCrary Sisters and more. The Woods Brothers take the darkened stage in Nashville. Chris plays electric and stand-up bass along with harmonica. Oliver is the guitarist and lead vocalist. Multi-instrumentalist Jano Rix rounds out the band. 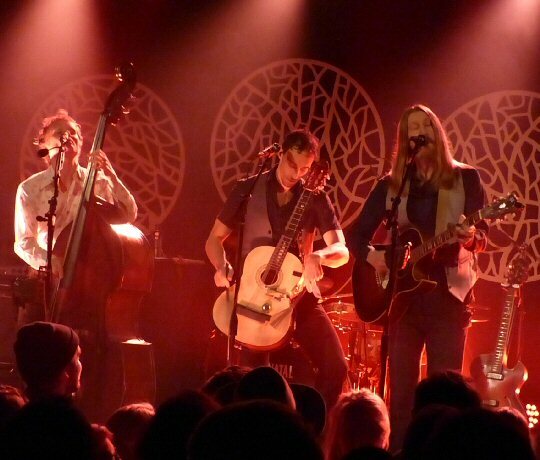 It was dark as The Wood Brothers opened with “Never and Always” which featured one to three part vocals layered over glowing grooves. The next number started with a stand-out bass solo from Chris then Jano brushed the guitar strings and tapped a sort of train chug rhythm on his instrument as Oliver merged into the mix. They meandered through a number of tempo changes during the animated “Atlas”. “How y’all doing,” greeted Oliver as they continued their unique blend of roots-jam. “Snake Eyes” was snappy with a horn section adding accents to the piece. A number of times Chris danced a bit with his stand-up bass. “Desire” was delightful with its up-beat tempo peppered by the horns. “Postcards From Hell” shared glimpses of a musician’s life with the narrator musing that “I got a soul that won’t sell’. The tale featured expanded instrumentation with Chris on the harmonica. 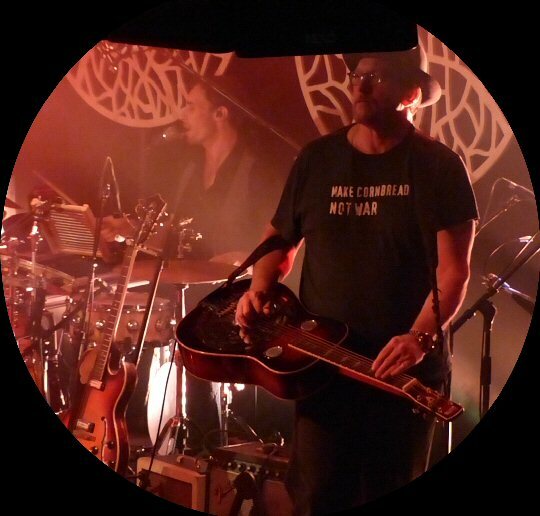 The story flowed into the insightful “The Shore” and “American Dream” both featuring fluid jamming from all members of the band. Chris and Oliver Wood front the fan-favorite family band. The Wood Brothers invited Jerry Douglas (resonator & lap steel guitarist) to join them for a more intimate set of songs. The four musicians circled an old fashion mic while asking the audience to be quiet. They crafted softer subtler music to accompany harmonizing vocals with a nod to the past. At one point they sang the timeless point that “when faith is gone give it one more day” certainly a relevant message for present days. 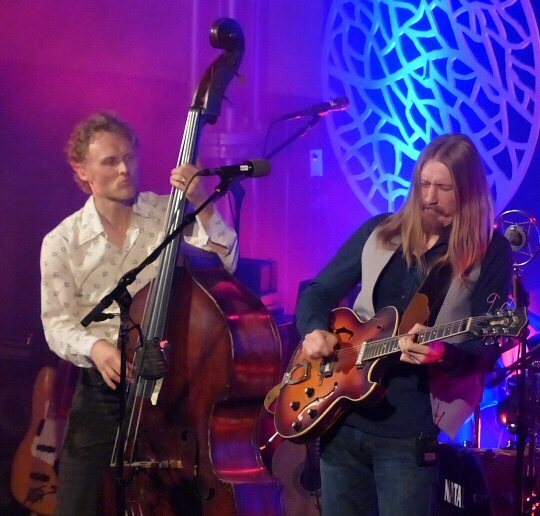 The Wood Brothers eased back into “modern times” with Chris switching to an electric bass for the next part of the show that featured a funky “Wastin’ My Mind”. Jerry stayed for “Midnight Rider” with the group giving the Allman’s cover their own unique spin. Oliver mentioned their current record Paradise which looks at longing and the ways in which the pursuit of fulfillment can keep it perpetually out of reach. The new album has been described as the band’s most rocking and sophisticated work to date. The Wood Brothers wove a number of these tracks into Friday’s set along with other flavorful tunes such as “Chocolate on My Tongue”. “Honey Jar” with Jerry was sweet with its danceable beats. “Ophelia” had experimental elements with each player putting their own signature on the classic tune by The Band. The encore of “Luckiest Man” and “Get Out of My Life Woman” were also expansive. The Wood Brothers enchanted the Nashville crowd on Friday night with a diverse, innovative set of roots music served up with a lot of jam. The much respected Nashvillian Jerry Douglas was the opening night special guest. Opening for The Wood Brothers was Sam Lewis a traveling troubadour who pens reflective compositions with a country flair. 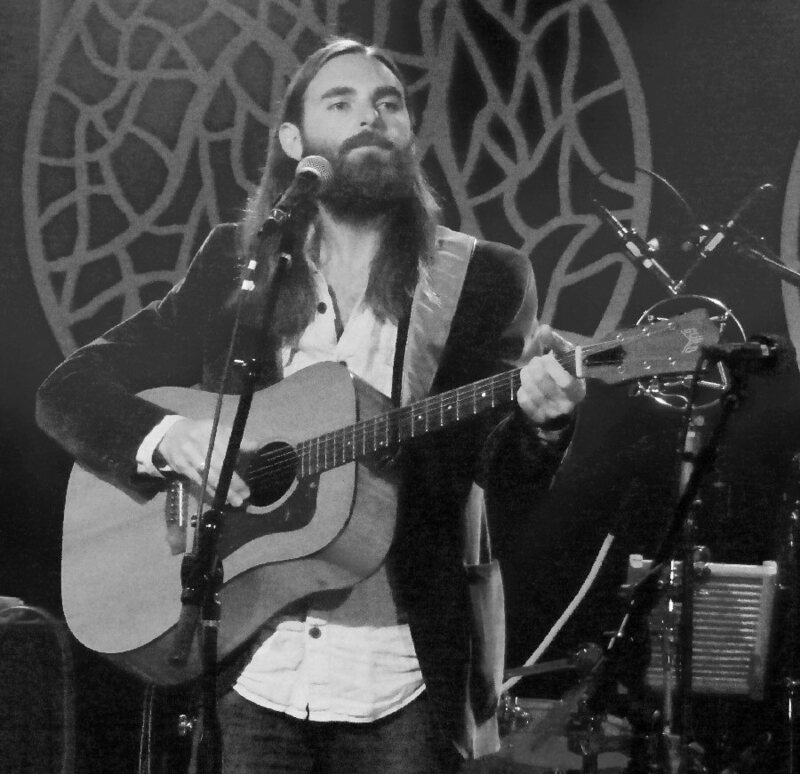 Lewis was personable chatting a bit between his compelling songs that included the story of lost love “In My Dreams” and a winsome “Waiting On You”. Sam had a musical twang paired with fine tales to tell. Later he shared his sentiments and a song saying that we need more Grandmas as they are the glue of families. This piece was filled with visuals of a simpler life paired with instrumentation that added to that imagery. Lewis was an engaging storyteller who played with emotion. 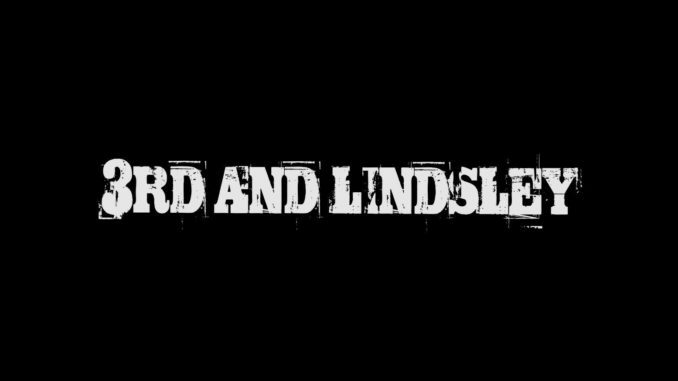 3rd and Lindsley continues to host a wide array of artists such as The Wood Brothers and Sam Lewis. This bar/restaurant with table seating along with a GA area in front of the stage will be celebrating 25 years of music in 2016. After 5 p.m. a number of 3rd and Lindsley’s neighbors allow free parking in their lots. Please check out the venue’s calendar for a full list of their upcoming events. Sam Lewis was the capable and captivating opener.